Topic: The Bridger Pass, Overland Trail, 1862-1869 : through Colorado and Wyoming and cross roads at the Rawlins-Baggs Stage Road in Wyoming : stories and history with rare photographs. Erb, Louise Bruning. Rev. [S.l] : L.B. Erb, A.B. Brown, G.B. Hughes, 1989 Printing by Journal Pub. 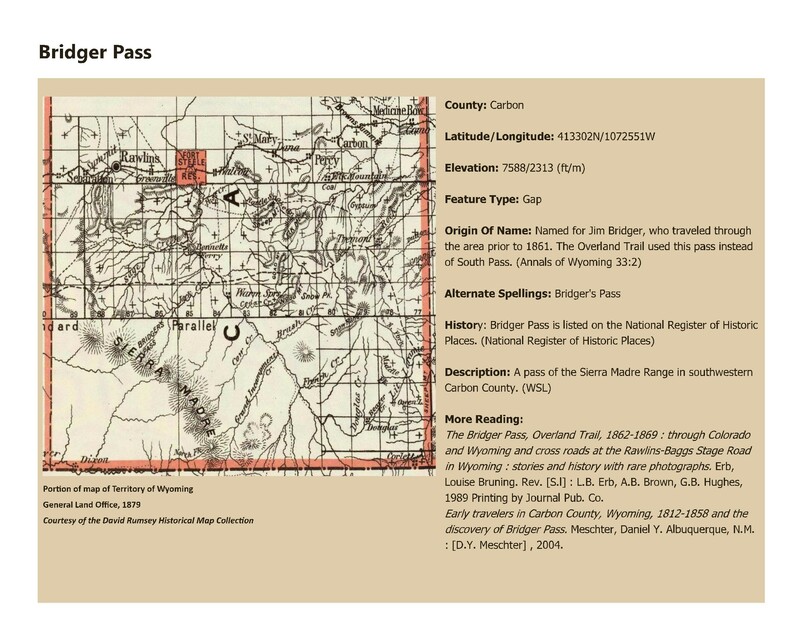 Co.; Early travelers in Carbon County, Wyoming, 1812-1858 and the discovery of Bridger Pass. Meschter, Daniel Y. Albuquerque, N.M. : [D.Y. Meschter] , 2004.